In 1966, Robert Huff was the president of Kappa Sigma fraternity at Lambuth College. A large fraternity crest was needed for the new chapter house. Robert made the crest and quickly realized there was a market for this product at every Kappa Sigma fraternity house in the country. After finishing his BA at Lambuth College, MA at Murray State University and attending Harvard University, the company began. The first state seal was created shortly thereafter for fraternity brothers Curtis Person, Jr. and Ken Baker, Tennessee State Senator and State Representative respectively. Since that time Robert has traveled to all fifty states promoting the business. 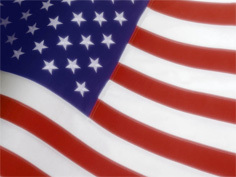 Seals have been made for all fifty states, foreign embassies and the British Parliament. In recent years the fastest growing segment for our business has been personalizing State Senate and House of Representative seals. This first personalized seal was made for Mississippi Representative Bill Denny. Custom seals remain a large segment of our business. We have made custom seals for cities, counties, state governmental agencies, sheriff departments, and national fraternal organizations. We have made customs seals for the city of St. Louis, Missouri, Dallas County, Texas, and the Georgia Appellate Court to name a few. Robert Huff Designs can be contacted at robert@roberthuffdesigns.com, or by telephone at (901) 754-2164. 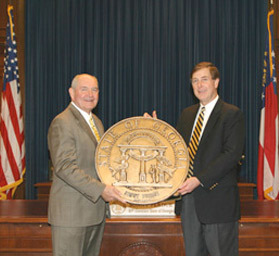 Robert Huff presents a personalized state of Georgia seal to governor Sonny Perdue.